You realize how important a small business blog is to your success online. Isn’t that why you’re here? Content is king when it comes to the Internet and getting people to care about how your business can help them. If you don’t have something awesome, unique, and helpful, your small business website will be limited in its growth potential. Helping people lets you reach new people through search and social media while building the trust that will eventually get them to do business with you. Before we get into the meat of how to start your small business blog, I’ll cover why your small business needs a blog (in case you’re not sure). If you’re just looking for a few tips, I also wrote a helpful article with 4 blogging tips for beginners to make a successful blog. You already know you need one, but why you need one is essential to know so you can approach your blog in a way that will benefit your business. We’ll focus on number two. Your small business blog is the perfect place to create content that people want. It gives your business a voice of authority in your industry and gives you the opportunity to help and connect with your potential audience one on one. You’re going to find more and morebenefits as you begin your blogging journey. Blogging is an essential approach to doing business online but it does take time. It’s worth the time, though. You’ll find three big why’s for creating a blog for your business website. Google won’t send your website traffic just because it’s there. Google’s goal and reason for existing is to answer people’s questions and give them helpful information, the best of that information too! Your small business blog gives you the perfect opportunity to answer the questions people have and build your brand. The more content you have on your website, the more likely it is to get traffic from search engines and social media. People will share your content, they just need something worth sharing. Your blog is a great place to give them something worth sharing. I wrote a post with 17 things your small business website needs and a blog is number 8. 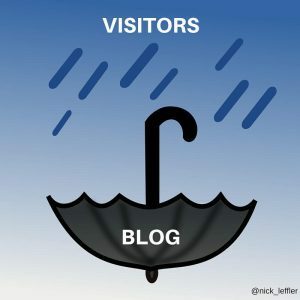 The post also illustrates how your blog helps you grow your inverted content umbrella to catch more traffic. With a blog you’ll be growing your traffic but you’ll also need to make sure you’re going to benefit from that traffic. It’s all about matching the goal of Google with your goal to achieve success with your small business blog. Your blog gives you the opportunity to become an expert in your field. If you are always writing about your industry and sharing information that helps people succeed, you’re going to be seen as an authority in your industry. Nobody knows you’re an expert or what you know unless you show them. Holding and protecting your knowledge and skills won’t ever help you get business, nobody will trust that you know your trade. If you share openly on your blog then you will give value, information, and people will trust you. What you do is skilled, it adds value, and it takes time. Most people would rather find someone they trust and spend the money to hire them. Trying to do it yourself is often a futile effort with limited results and a lot of wasted time. Your blog is a place to answer the questions that will help show your business as a trusted authority. Not only will you build a relationship with customers who need your help but you’ll also build respect in your industry. What will it get you in your industry? Probably valuable links back to your website and the articles you post. The more valuable your information, the more likely others are to link to it. With enough valuable information and links, search engines like Google will eventually look at your website as an authority and rank it higher in search results. Traffic and authority is great, but it doesn’t get you business. Your small business blog needs a way to turn the visits into return visits and build relationships further into customers. Your business needs customers. A customer’s journey to their purchase isn’t a straight line from a search to your website to a purchase. There are many detours and twists and turns. Throughout that complex journey it can be hard to stay in touch with customers. A small business blog gives you the opportunity to capture leads and keep the relationship alive and thriving. You’ll be able to build an audience of customers interested in your service. With an audience you can stay top of mind with your customers easier, the sign of a strong online brand. When they’re in need of your service, you’ll be the person they go to. Your blog will give you the opportunity to grow your audience with your email list, on social media, and more. Now that you have some reasons why a small business blog is so important, let’s get into the important how to starting with asking yourself if you have the resources. Because you run a small business you’re familiar with having limited resources. Because your resources are limited there’s one question you have to ask before you start too far down the blog rabbit hole. The one question to ask first is if you have enough resources to start a blog. That means you either have the money to spend to have a professional writer or you have the time and skill to write posts yourself. If you don’t have the skill, it’ll take time to learn. This isn’t a problem though because your blog doesn’t have to be perfect at first, it can be a work in progress. Both the money commitment and time commitment will be unique to your small business blog. To give you an idea, I commit about 6-10 hours per week to this blog, yours may not need as much, though. So, do you have the time resources or the money resources? If so then you’re in good shape for growing your business online. Now it’s time to figure out what your goals will be for your blog. Having a goal for your blog is the single most important part of your path to blogging. Without a goal then you don’t know if you’re on track to meet it or if you need to adjust your strategy. In other words, you’re flying blind. Without a goal you could be flying blind for months without achieving growth and wasting a lot of time. This could lead to getting discouraged and giving up blogging altogether. Blogging is such a great way to grow traffic that giving up could be harmful to your small businesses online presence and eventually your growth potential (that’s why I recommend starting early). Determine your goals early and check in on your progress regularly. Your blog will be more successful and you’ll be happier with your results when you’ve set goals. Now that you have determined your goals, it’s time to go a bit further. Hopefully you know a bit about your audience already if you’re running a small business. If not, it’s time to get to know them so you know who you’re writing to. Know their education level, the pains they have that you are trying to solve, and as much about them as you can. Even traits that don’t seem relevant for your blog are. Be ready to create a buyer persona and document as much as you can about your customers/readers. Knowing your audience will give you the benefit of being able to tailor your posts better to that audience. You’ll be able to better understand the problems they experience and how you can begin to solve them with blog posts. Anticipation of your audience’s needs is the best way to answer their question and be seen as an expert. You have a pretty good plan together at this point and you know you have the resources, great! Now it’s time to decide where to blog. Starting a small business blog is no easy feat. Figuring out where to blog is another difficult step. You have options that you host on your own servers and options others host for you. In both scenarios, it’s important to stay in control of your online brand as much as you can. In any scenario your visitors shouldn’t know the difference between being on your website and being on your blog. Your blog and website should both have the same feel and branding but some options aren’t going to provide that to you. Your options are going to be hosting your blog yourself, on your current business website, or hosting it somewhere else and linking to it from your website (or it could be a one way road). Let’s take a look at hosting it yourself first. Depending on your website configuration and how it’s built, hosting your own blog may or may not be a big deal. If your website is running a platform like WordPress.org, this will be where you should blog. Some content management systems are better than others for blogging but most of them have blogging built in. Even major eCommerce platforms like Magento have blogging platforms built-in which will probably make it a no-brainier for where to blog. If your current website has a blogging platform available, use it. If it doesn’t, it’s either time to look for a new website or try to tie together your current website with another blogging platform. Just try not to use sticks and bubble gum to stick them together, visitors will know and it won’t make you look good. There are so many options available for blogging on an external platform so I’ll only mention a few. Before I mention the few though, I have to give a disclaimer to using these services. Similar to how using a website builder such as SquareSpace limits you, these blogging services also limit you (some more than others). If you decide to use a service not hosted on your website, it may hinder your ability to grow your audience and build authority. Your visitors won’t see your branding as much as they’ll see the branding of the site you’re hosting your blog on. LinkedIn for instance wants to keep visitors in their ecosystem. You’re essentially building their audience and limiting your own audience’s growth. Think about how this choice will effect your business down the road and know that once you start blogging, it’s not easy to move. Plan for the future and prepare for your business to grow now rather than when it happens. Some of these are better than others, but it’s hard to tell you what will fit your specific needs. Before you make a final decision, be sure to plan because once you start blogging, it’s hard to go back. You’ll start building an audience and establishing your place in search results. Changing blogs will knock you back to square one in most cases, so plan for the future. Another warning about other services. Keep in mind that someone else will own your content and it’s up to them to keep their service running. Companies are sold, bought, and discontinue services regularly. You are at their mercy with your blog. Now that you’ve chosen where to blog, it’s time to get started creating your blogging calendar with your awesome ideas. Starting a small business blog involves a lot of planning. Without planning there won’t be a cohesive flow to your blog and your content could fail to meet the quality needed to give value to your visitors. Making a list and checking it twice will help you create the necessary cohesiveness for your blog. After the list comes scheduling your posts out which is just as important. If an idea pops into your head for a blog post, write it down! I keep a running list of blog post ideas which I then transfer to my blog, expand on in my notes, than schedule them out (we’ll get to the scheduling part). Making a list also gives you the benefit of having more thought in your blog posts before they ever make it to your blog. This is good because you want your posts to be valuable to your visitors, not to you. In other words, write to solve others problems, not yours. They could be one in the same sometimes, though. Going back to why you should start a small business blog, it’s all about answering people’s questions. You have your list, you’ve checked it twice, now it’s time to pick a schedule and start scheduling your posts! Not all of visitors to your small business blog will be regulars, but for those that are you want to post on a schedule. This creates predictability and comfort. Choose the schedule you will blog on early and make sure you stick to that as closely as possible. You aren’t locked into that schedule forever, but be sure not to change it too often. Your schedule will be determined by how often you can blog (back to the time and money thing). If you can only blog once a month, fine, but schedule it for something like the first Monday of each month or perhaps every 4 weeks. My schedule for this blog is every Monday and Thursday which I made when I started blogging regularly. You may start blogging more often at one point and that’s great, the more you blog the more benefit you’ll receive. If you do start blogging more often, it’s perfectly fine to change your blog schedule. You have some blog posts scheduled and you’re getting really excited to start showing the public what you’ve been working on. Well, nobody will know about your blog unless you tell them. I had a hard time determining the best place to put this section. It’s relevant in the beginning and it’s relevant at this point. I decided to place it here because it has the most relevance here and I wanted to reward those who read this far down with some good information. You can raise awareness about your new blog before you launch and after you launch. Let’s take a closer look. You don’t have anything to show people before you launch so this one is a bit tricky. How do you raise awareness before you even have something to show? Tell people about it! Let them know it’s coming and point them to a place where they can sign up to receive an alert when you’ve gone live with your small business blog. Share it on social media and on your email list. Don’t have an email list? It’s time you set one up! Let people know what they’ll be getting and why they should sign up. Those that sign up for alerts on your blog release are true fans and good people to stay in touch with close. You can even put in your email signature line a small blurb about your upcoming small business blog and a place to sign up to receive an alert on launch. It’s a bit easier to raise awareness when you have something to raise awareness about. Now that you have your small business blog up and running, tell people about it! Send an email to everyone who signed up to be alerted of your blogs launch. Share it with your friends on social media. Get out there and spread the word and mention it any chance you get. As you start writing more posts you’ll be able to raise awareness simply by sharing articles when they are relevant in conversations. You’ll be conversational, knowledgeable, and helpful! You came a long way and done a lot to get your small business blog up, now it’s time to celebrate and keep up the momentum. You have a few posts in your pocket now and you’re seeing some interest. If not, don’t get discouraged, these things take time. To see an increase in traffic, your blog needs at least three months to ramp up in search engines and start receiving regular traffic. It may take longer if you’re only blogging once every few weeks or once a month. As time passes and you grow your library of posts, be sure to check back in on your goals on occasion. Those goals will help you succeed and keep you focused on what you need to do with your blog. Once you’ve reached your goals, consider making new ones. Blogging success is always a moving target and constantly adjusting your goals and approach will make sure your blog stays fresh and relevant for a long time. If you’d like to chat about your small business blogging goals, I’m always available for a chat. If you want to chat a little more about your business brand online I’d love to give you a free 30 minute consultations, online brand review, and customized report.